Walnuts have become a staple in my house after we bought an enormous bag at Sam’s so that I could make biscotti Christmas gifts. Even after all the baking, we still had a couple of pounds of shelled walnuts. Thinking, “We’ll never get through that many walnuts,” I’ve used them in everything I could think of this winter: with greens and pasta, in salads, oatmeal, and desserts. And last week, I scurried off to Sam’s to buy another enormous bag of walnuts. Nuts are good for you. They’re high in unsaturated fats, Omega-3 fatty acids, and arginine. The Harvard School of Public Health touts the cardiovascular benefits of eating nuts, and The Mayo Clinic describes their part in healthy Mediterranean diets. Pick a green: kale, mustard, beet, turnip, bok choy, Komatsuna, sweet potato – just not collards. Pick a dried fruit: raisins, craisins, figs. Pick a nut: pine nuts, walnuts, macadamias. Sauté the fruit and nuts in olive oil and remove. Cook the greens until wilted. Return the fruit and nuts, salt and serve. Here’s a post with more details about the recipe. Try out new green, fruit, and nut combinations; the lists above are of the ones we’ve had, but they’re certainly not exhaustive. The only tricky part is when you start changing greens. The tougher the greens, the more cooking time they will need. 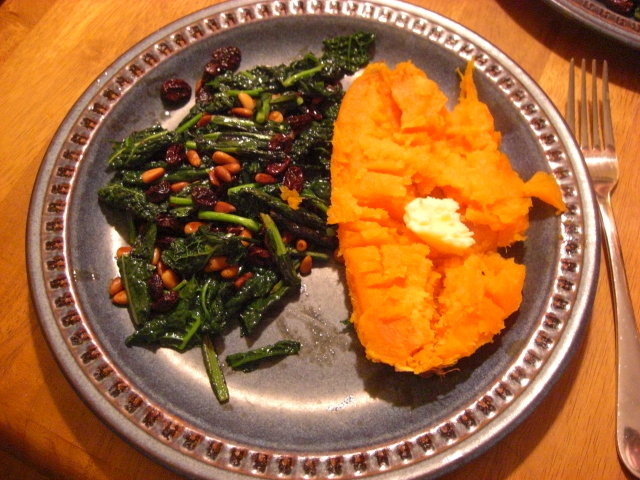 Also, some greens cook down more (Komatsuna and sweet potato, for instance) so you have to start with more than you would if using tougher ones (like kale). I’d forgotten that kale and Komatsuna were so different, and the last time I made Komatsuna greens this way, I wound up with half as much cooked Komatsuna as I needed. Thankfully, there was more Komatsuna in the crisper. A quick, light dish of nutty, olive oil-y, lemony pasta plus whatever fresh herbs you have lying around. For more info, see Herby meal #2 of this post. 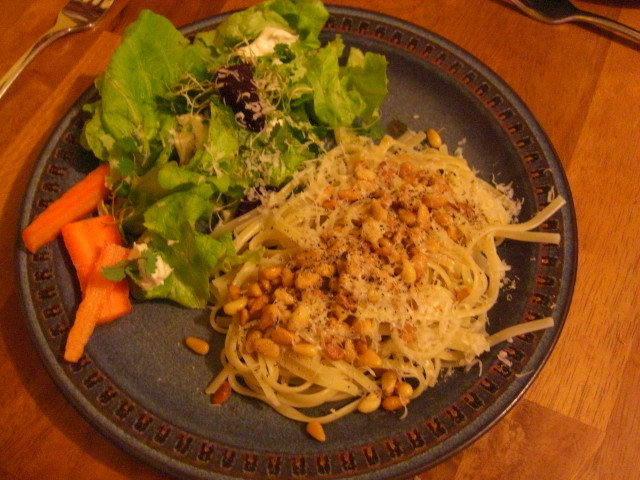 Another great, quick pasta dish – this one’s got butter, pine nuts, Parmesan, and pepper. 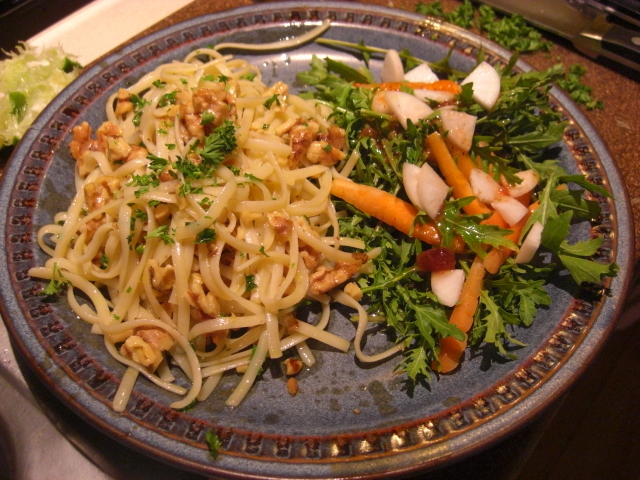 Make salads heartier with toasted nuts and cheese! 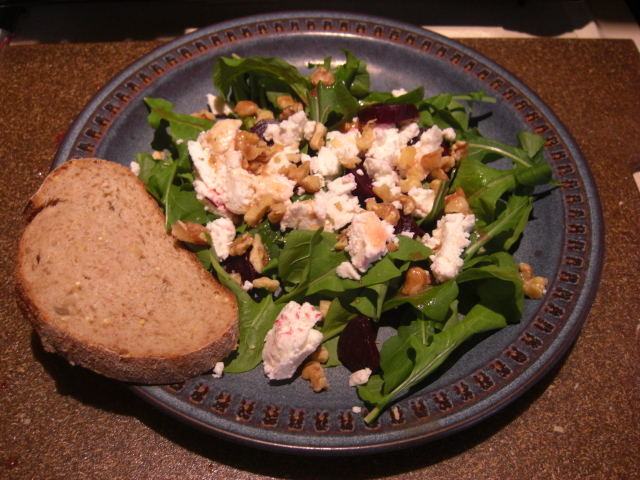 So far, my favorite salad is arugula with toasted walnuts, chilled roasted beet slices, and goat cheese.